Combat Medicine: Fast-Tracking Troops to Germany Hours after being injured in Iraq, Lt. Kevin "Brad" Mellinger traveled more than 2,000 miles to an Army hospital in Landstuhl, Germany. Innovations in combat medicine prepared doctors for his arrival: They saw his x-rays before he landed. 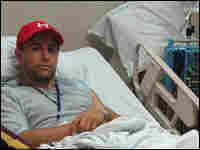 First Lt. Kevin "Brad" Mellinger recovers from a gunshot wound to the thigh in his room at the Army medical center at Landstuhl, Germany. He's pictured here less than 24 hours after he was shot in Iraq. Nearly 30,000 U.S. troops have been injured in Iraq — about half of them with permanent disabilities. In Iraq and Afghanistan, troops who are wounded in an attack have a 95 percent chance of surviving. It's the highest survival rate in the history of warfare. Once a serviceman or woman is injured, they enter a kind of conveyer-belt of treatment that begins with an evacuation from the battlefield to the trauma ward at Balad Air Base. Soldiers then go to the U.S. Army hospital in Landstuhl, Germany, thousands of miles away. It's a cycle that sometimes takes just a few hours. NPR's Defense Correspondent Guy Raz presents a three-part series on critical care in the war zone. Part One of the series starts on Morning Edition Thursday with a look at an Army helicopter unit that flies to the battlefield to rescue those injured. Part Two, which airs on All Things Considered Thursday, will examine the air force hospital at Balad Air Base, one of the most advanced combat field hospitals in the history of warfare. Finally, Part Three — which airs Friday on Morning Edition — will follow an injured soldier to a U.S. Army medical center in Landstuhl, Germany. A wounded soldier's journey can go from the battlefield to a field hospital at Balad Air Base — about 60 miles north of Baghdad — and then to an army medical center in Landstuhl, Germany, all in a matter of hours. 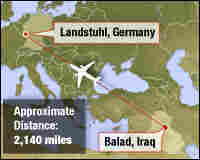 The tiny hillside hamlet of Landstuhl, Germany, is barely a six-hour flight from Balad Air Base in Iraq. But it might as well be on another planet. Landstuhl is green and peaceful and far away from the dust-choked deserts of Iraq. Army Lt. Kevin Mellinger arrived at the U.S. Army Regional Medical Center in Landstuhl about 20 hours after being shot in the thigh by a sniper in Iraq. The high-velocity round shattered his femur into a hundred different pieces. 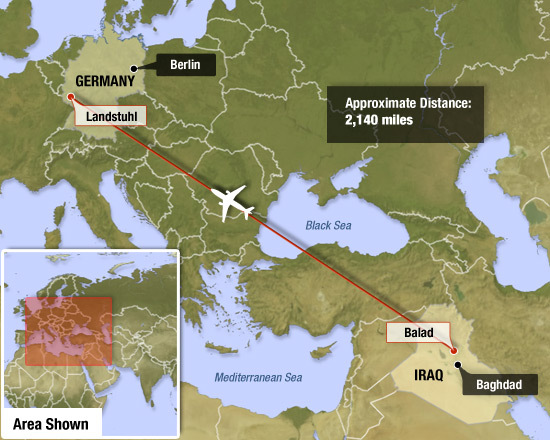 The flight from Balad actually lands at nearby Ramstein Air Base, where a bus equipped to carry stretchers and medical equipment meets the patients. 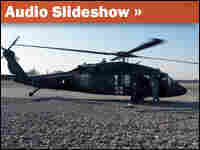 Landstuhl hospital is about 10 minutes away from Ramstein. When the bus arrives, dozens of hospital medics and volunteers are on hand to help off-load the patients. By the time Mellinger arrived at the medical center, he had already undergone one operation at Balad hospital in Iraq. At Landstuhl, doctors will perform a second, to wash out the bone and bullet fragments. After a few hours of rest and recovery, Mellinger wakes up to call his wife back home in Fort Bragg, N.C.
"I told her that I was coming home for Christmas," he said. But his wife didn't quite understand. "What?" she asked incredulously. "I thought you were extended for 15 months. That's what they told me yesterday." But then Mellinger broke the news. "Babe, I got shot." On the other side of the hospital, the doctor who operated on Mellinger at Landstuhl, Navy Capt. Charles Pasque, looks at the soldier's x-rays. Pasque sardonically calls it a "good war wound." The doctor explains that with physical therapy, Mellinger will recover within a year. He notes that Mellinger got lucky. The bullet struck a blood vessel in his thigh. But it also ricocheted off his femur, which slowed the bullet down and prevented a potentially worse exit wound. By the time Mellinger arrived at Landstuhl, the doctors already had a thick file with his medical records, including x-rays and a CT scan. It's another innovation of combat medicine. Doctors now transfer electronic files and scans back and forth between Landstuhl and the combat hospitals in the war zones. There is also a live video link between Landstuhl and the combat field hospitals in Balad and Bagram, Afghanistan. "We're able to prepare well in advance for the patient's arrival," explains Col. Stephen Flaherty, the chief of surgery at Landstuhl. "We know exactly what has happened to [the patient] and what interventions have already taken place." Flaherty says that since the start of the Iraq war, doctors have learned key lessons in trauma care. That's due in part to the distances and the speed at which critically wounded soldiers now travel. "You know, 10 years ago, 15 years ago, we were not flying people who were critically ill at 10,000 feet. We can do that now," Flaherty says. That's because of the risk of what's known as "compartment syndrome." High altitude sometimes causes muscles and tissue to swell and decay. But over the past three years, doctors at Landstuhl have learned that they often need to perform an immediate fasciotomy, a procedure where an incision is made deep into the skin, to relieve that pressure. Back in the recovery room, Mellinger is emerging from a fog. 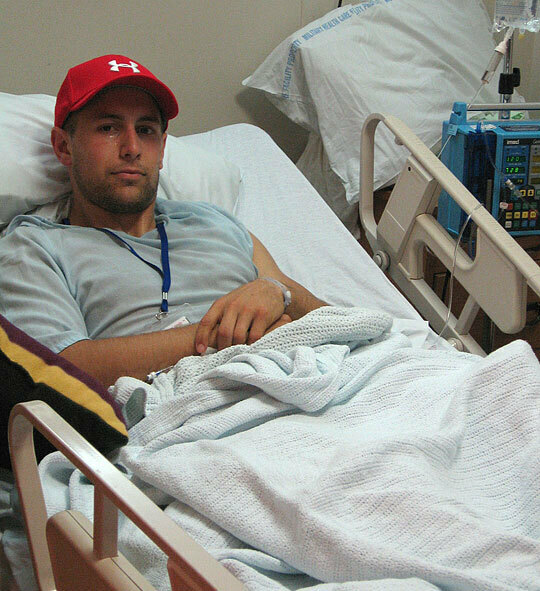 Lying in his hospital bed, he starts to recall the incident that could have killed him. "It was scary, it was very scary. I thought I was gonna get shot again because they were close," Mellinger said. He pauses for a moment and remembers what went through his mind. "I thought to myself, 'Well, God, if this is my time to go, well, I know I'm going to heaven.' So I felt confident," he said. "But then I thought, 'Lord ... I know my time is not yet.'" Mellinger is just 24 years old, his whole life ahead of him. Indeed, he was lucky. He cheated death. But he also knows that since the war began, more than half of those who didn't make it out of Iraq were even younger than him.